Are you on the hunt for a new home with picturesque mountain views, beautiful fall foliage and resort-style amenities. Look no further you have found it here in Transylvania County of Western North Carolina! Framed by the beautiful Blue Ridge Mountains, outdoor activities such as hiking, whitewater rafting, hunting, and fishing make Transylvania County the perfect place to call “home” Capture the serenity of the mountains and take advantage of level to rolling property with excellent views, secluded building plots in the trees for your dream home or recreational getaway. This is truly one of the most elegant, handcrafted homes in Whiskey Creek of Brevard, North Carolina. This property is resting in a perfect tranquil, private setting. You will enjoy your year-round mountain views from both master bedrooms, the family room, dining room and even the office. Relax on your screend porch or the open decks which also captures the mountain beauty. Take a hike on the 5.5 acres on a crisp, fall afternoon among the brilliantly colored leaves, returning to a crackling fire in the massive stacked, brick fireplace. This lovely home features rich, natural wood floors in the foyer, kitchen and dining areas. The kitchen has quartz counter tops, Kitchen Aid ceramic top range and dishwasher, a french door refrigerator, Kohler sink and faucet. The master bedroom suite on first floor offers a cozy gas fireplace in a lovely bricked wall plus a three-season porch/sitting room off master with floor to ceiling windows. You will enjoy the spacious family room with vaulted cathedral ceiling, a large bricked wall surrounding gas fireplace with raised hearth. There is also a bonus room on lower floor which is large enough to accommodate two offices and may also serve as a playroom, TV room, etc. Plus a two car garage and a large unfinished basement area for ample storage. Known as “The Land of the Waterfalls” a name derived from the many waterfalls in the nearby Pisgah National Forest, Brevard is a nature lover’s paradise. State and National forests cover more than one-third of Transylvania County, providing endless possibilities for hiking, backpacking, camping, and rock climbing. The French Broad and Davidson Rivers are popular for fishing, kayaking, canoeing and tubing. It’s this combination of rural natural scenic beauty and urban convenience that make Brevard such a special place to live. The world renowned Brevard Music Center, home to outstanding guest musicians and artists during the summer months, offers concerts several times during the week. Numerous festivals fill Brevard’s streets throughout the year, contributing to the sense of community that is so evident in this unique mountain town. This outstanding 2+ acre lot in Glen Cannon of Pisgah Forest, North Carolina is ideally located on Campbell Drive. The driveway is already roughed in to the nearly level building site. Build your dream home in nature's private haven with sounds of the creek below. Take advantage of this golf community and head off to tee time on one of the finest courses in Western North Carolina. This lot truly has it all! Jay & Jewell Kaiser are extremely passionate about real estate. We make it our daily goal to strive to be the very best real estate professionals in the Brevard, and Western North Carolina area. This requires us to be the most informed professionals in our market area… In today's market, it is so very critical to stay abreast of new technology tools, changing laws and industry rules. Fall is in the air, and if you are like a lot of Western North Carolina home owners, the urge to bring a little of the magic of fall indoors is almost irresistable. 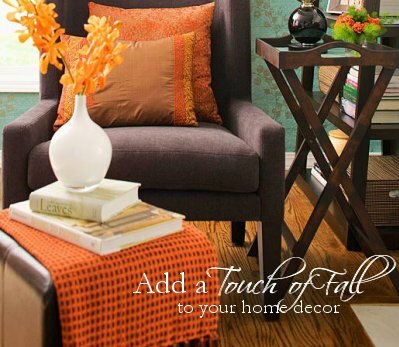 There are lots of ways to update your living space to reflect the splendor of Fall. It doesn’t take a lot of money or time to create a warm sense of home and hearth indoors. When thinking about color, use hues and tones that mirror the vibrant splashes of colors you see during this season. Think about changing up your home décor with a new coat of paint or accessories to complement your current pallet. Consider using golds, chocolates and bronzes for a warmer feel, or work in jewel tones to add a sense of richness and luxury to your room. A new space rug or wall hanging can completely transform your room’s look. Layering and texturing can also work to add warmth and comfort to a room. Try adding a new throw to your current chair, or textural pieces like suede pillows or cashmere blankets to a bed. Wall treatments like textured wallpaper can also add variety and a bit of a warm dimension to any room. If you have a fireplace, play up this focal point in a room to reflect the sights and sounds of the season. Add seasonal yet decorative touches to the mantle (pine cones, cinnamon brooms, etc.) to complete your look. Fall comes to the kitchen too, so don’t forget to switch over your accessories to match! New towels, pot holders, window and table treatments, and other homey touches are easy things to add to increase the Autumnal feel of your home’s hub. Mini pumpkins, gourds and seasonal fruit and flowers also add to the ambience. When it comes to decorating for Fall, your only limitation is your imagination! Have fun! A Mountain Retreat – Fishing Cabin in Lake Toxaway, North Carolina presents a pond stocked with trout and bass. This private property offers a bold creek, large fenced yard, paved frontage. Move in condition with one level living, hardwood and tile floors, wood fireplace with gas logs. You will enjoy the great room with 11'10" wood ceiling, wood walls, 2 bedroom suites with a split bedroom plan. A kitchen any chef will fall in love with, hard surface counters, gas stove and more. Curl up with your favorite book in the heated Carolina Room which overlooks the pond and creek. This characteristic lot in Mills River, North Carolina has an old spring house ideal for a man made small waterfall and small pond with easy access roads. Level to gently rolling land with light restrictions; RV’s, Campers, Mobile Homes, Stick Built all welcome, including your horses. Weather is perfect at a cool 3000+- foot elevation. Located just a few miles to DuPont State Forest, and the Pisgah National Forest, WalMart, restaurants, and groceries. Only 14 minutes to downtown Hendersonville or downtown Brevard. You will enjoy perfect privacy located at the end of a cul-de-sac. Buy lot 2 and 3 together for 2.3 acres. Mills River is only minutes of Pisgah National Forest, Interstate 26, and Asheville Regional Airport. Highways 280 and 191 serve as the major arteries and provide access to the nearby cities of Asheville, Hendersonville, and Brevard. Mills River is 22 square miles in size, is home to approximately 6,830 residents, and has a rich history in agriculture. The Mills River area is the largest in the Pisgah Ranger District. Trails in this area tend to be less popular, more remote, and less traveled than their counterparts over the ridge in either Bent Creek or Davidson River. Two main watercourses flow through the area – the North and South Mills River, which join together near the town of Mills River further East. These rivers drain the south side of the Pisgah Ridge, which sports the highest elevations in the Mills River area (up to over 5000' on Laurel Mountain).